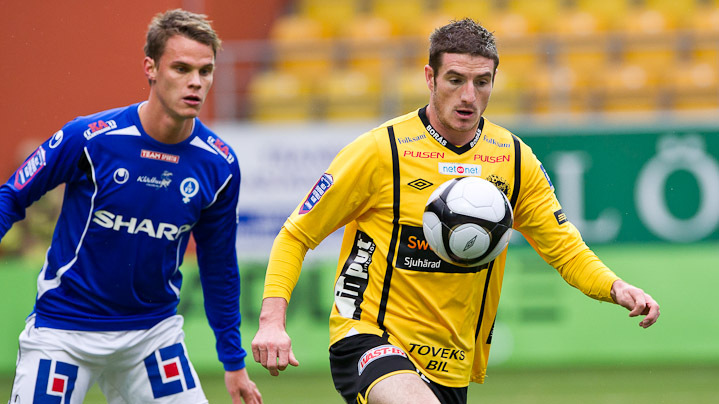 In part one of our James Keene interview, James talked about the current Allsvenskan campaign and his time playing for Elfsborg. Here James, consistently one of the top players in Sweden since making the move over in 2006, talks about how he arrived in Sweden life in the country. When I first arrived in Sweden it was so cold. On my first day it was -25 degrees and I was frozen solid. I went along to training with my agent to watch the GAIS squad and we both just stood there shivering. I’d turned up wearing just a jacket and there’s everyone on the training pitch with all of these training tops on. In the end the manager, Roland Nilsson, gave us the keys to his car and we went and sat in there with the heaters on to defrost. When I signed had to go out and train in the cold, I grabbed as many training tops as I could. Everything had happened so fast for me. At the time, I was playing in the reserves at Portsmouth and Roland Nilsson rang Jim Smith, the manager at Fratton Park at the time, to ask if he had a forward that would be good enough to play in Sweden. Jim mentioned my name and I went to GAIS on loan. At the time GAIS were almost destined to go down; everyone had tipped them for relegation. I scored ten goals and GAIS stayed after finishing in tenth place. There was a lot of interest in me from Scandinavia after that first season at GAIS. Elfsborg came in for me and when I met them, their ambitions were clear. Everything seemed right to me. Their training facilities were great and they’ve made me a better player. I turned down a number of other teams to come here; it wasn’t a hard decision. They have a great stadium, better than many in Sweden. Not many clubs have managed to achieve the consistency that Elfsborg have had. We’ve been up towards the top of the league for a number of seasons now. Teams are inconsistent too often, IFK are a good example of that, where they will have a year or two challenging at the top but then will struggle for a period of time. The club keeps changing for the better and improving. The people in charge of the club are the right people at the right club. They aren’t satisfied with that one Gold; they want more. They are running the club in the right way: they don’t overspend, they don’t bring in the wrong players for the club and they remain positive. We’ve got the best player in Sweden at Elfsborg, Andres Svensson. We always rib each other due to the Portsmouth and Southampton connections, with him being a former Saint. I used to always have the upper hand when they were struggling and Portsmouth were doing well but recently I haven’t been able to say so much with them winning and Portsmouth struggling so much. I watch the big games in Sweden, games like AIK v Djurgården, Malmö v Helsingborg or AIK v IFK Gothenburg, but to be honest I don’t watch a great deal. I watch every Premier League game that I can though. I grew up as a Manchester United supporter, my dad is a huge fan. I used to have my name on the back of my United top as a kid and people used to come over and tell me that I’d spelt Roy Keane’s name wrong! I grew up watching the likes of Andy Cole, Dwight Yorke and Teddy Sheringham. I played alongside Teddy when I was at Portsmouth. I couldn’t believe it at times that I was playing alongside a legend and a hero of mine. He’s a nice, normal guy though. He’d stay behind after training and help out with my shooting and finishing practise. Malmö have a fantastic stadium. The pitch is great, there’s a good atmosphere there and they have a great fan-base. We always have good games when we play at their place. I don’t like the stadium at Gothenburg, I’m not sure exactly what it is but the pitch never feels quite right. Råsunda is fantastic but playing at Hammarby is special – they have the best fans in Sweden. It’s a joy playing at Söderstadion and games are always a special occasion played in a great atmosphere. It was bad for Swedish football when they were relegated. AIK fans are great when they are on your side but they can turn on their players quite quickly. They love Kenny Pavey; it’s the fire and the English spirit he has that they love. Along with Hammarby the AIK fans are the working class fans of Stockholm while Djurgarden are the richer set of fans. AIK fans are the workers and the people who fight to get what they want. I love living over here. Sweden is very family orientated and everyone is polite and calm. People pay more in taxes here than in England, but they’ve got such great dental care and schools for example and it’s such a healthy country. You see people jogging all of the time and kids cycle to school and exercise regularly. The public transport is great, with it rarely being late. Everywhere is so clean, tidy and beautiful. I loved Gothenburg when I first came over but now I live in Borås it’s easier. When someone first moves to a new country it is better if they are in a smaller town because going to the shops or for a walk you always see the same people and so you get to know them and become friendly. When I was in Gothenburg, a much bigger city, I rarely saw the same person twice. Borås is great at the moment as it is small and quiet; perfect with me having two kids. It costs about 60 crowns for three-quarters of a pint which is expensive. You go on a normal night out and you can easily spend about £100. But Borås isn’t as expensive as Stockholm or Gothenburg and I find that when I go back to England everything is getting more expensive. Here in Sweden you don’t see much of a change in prices. I’ve made a great effort to learn the language now and I give all of my interviews over here in Swedish. I used to find it hard to read but was able to speak the language well after a short while over. I’ve been here for five years now and if the opportunity ever arose to represent Sweden then I’d definitely take it. As a country there are so good at sports and I always find myself cheering them on, whether it is skiing or anything. It’s quite good having two different countries to cheer on and support! I’d never do snus – it looks terrible. I haven’t even thought of it. When I first arrived at GAIS some of my teammates used to do the loose snus. You’d be talking to them and then notice black stuff dripping down their chin. My mates get over to see to me a few times a year and they always take some back. They always plan a trip over at the end of the season so that we can all go out and have a few beers. They like visiting here as there’s usually good weather, they watch me play, and of course they don’t complain about the Swedish girls. It’s difficult to fly back because I’m from Somerset and so having two young kids it’s not ideal to get them from the airport and then travel the long distance back to where I’m from. I was back over at Christmas and returned to Sweden in January but I won’t be flying back until December. My dad comes out to see us five or six times a season to watch me play and he loves spending time with the family. I see Calum Angus quite often as we’re really old friends from Portsmouth; we’ve known each other since we were 14 years old. I was excited when Calum sent me a message saying he was moving over. He sent me an email saying “You’ll never guess where I’m going! I’m coming to Sweden”, and I replied, “What? Why are you coming here?” and he told about the move to GAIS. I hadn’t expected it. He came through to Borås when he first moved over and he still comes through to see us and the kids. It was great to have a good friend moving over. I don’t see much of Kenny Pavey but whenever we play AIK we have a chat. We normally beat GAIS so it’s a good relationship I have with Calum! Both Elfsborg and GAIS had their training camps over in Portugal during the winter and we had a match then. I was doing quite well and he ended up kicking me a few times shouting at me to get up. It’s good playing against each other; he’s an aggressive player and good tackler. James was in conversation with Andy Hudson – June 2011. © 2012 All content unless otherwise stated is owned by Blågul Fotboll and may not be reproduced without written permission.